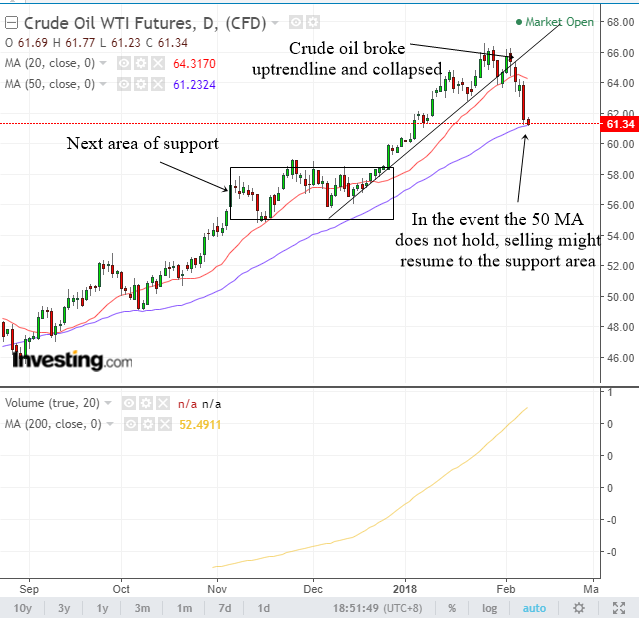 Is Oil Prices Headed For Massive Trouble? The recent plunge in the financial markets has brought many world markets and financial instruments down. Even cryptocurrencies such as Bitcoin is not spared from the heavy selling. Oil prices have not escaped either as the Crude Oil WTI Futures has dropped more than 7% from its recent peak set in January 2018. Brent Oil Futures have also fallen from the peak of $71.28 set in January 2018 to $65.50. With such a drop, many investors will be wondering whether this is the start of a massive sell off in oil prices. In times like these, we need to look at the trend of oil prices to see if there is any crack in the uptrend. To do so, we need to look at price action and the bigger picture. 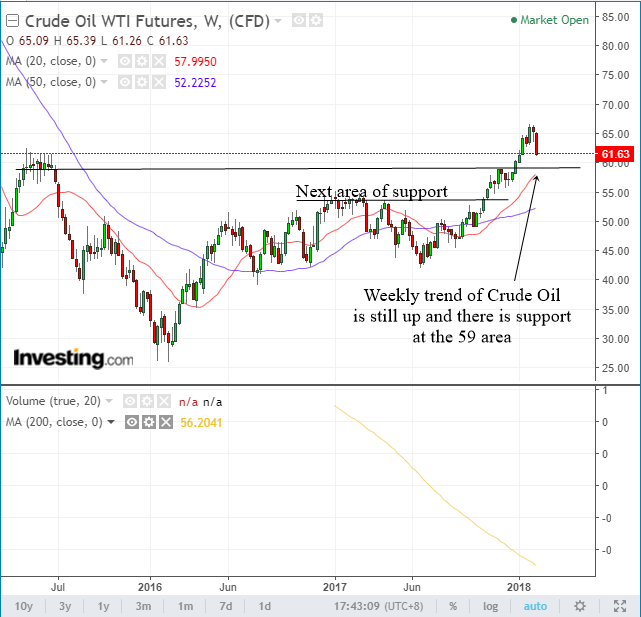 One of the ways is to take a look at the weekly charts of oil prices to see whether any significant trend change has occurred. The chart above is the weekly chart of Crude Oil WTI Futures. As you can see, the price of Crude OIl has been running up and it was ripe for some correction. Despite the current correction, it is still in a weekly uptrend making higher highs and higher lows. So far there is no significant trend change in the weekly chart of oil. For a trend change to occur, Crude Oil needs to form a lower high and a lower low in the weekly chart. Therefore, we will consider the current drop to be just a correction after a nice run up. There is significant support at the $58 area. So if oil prices drop to that area, you can expect Crude Oil to have some kind of bounce up. In the event that the $58 area does not hold, there is another significant support area around $54. Let us take a look at the weekly chart of Brent Oil Futures. As you can see, Brent Oil is also in a weekly uptrend making higher highs and higher lows. There is still no trend change yet. Brent has been trading above its weekly 20 MA and has not dropped below it yet. There is nearby support at the $63 area. In the event the support does not hold, we have another strong area of support around $57. 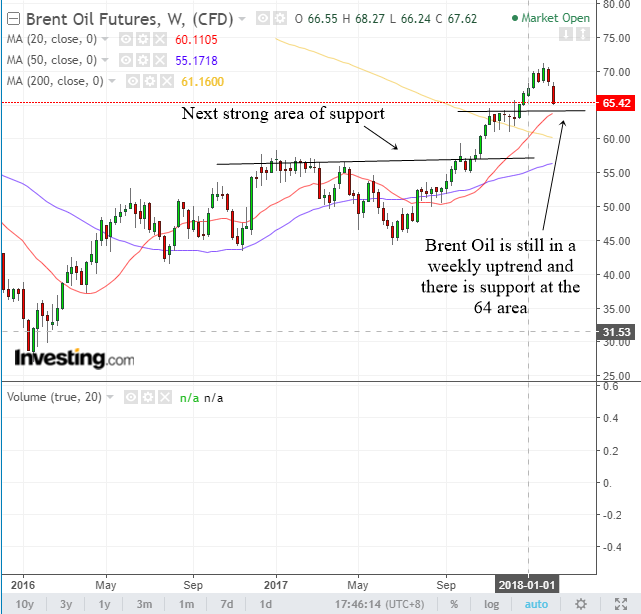 From a study of the long term weekly charts of both Crude Oil and Brent Oil, we can say that they are currently in correction mode and not in a bear market. Both of them are still in a long term uptrend and therefore one should not expect a significant change of trend yet. When oil prices reach the support areas, we will have to monitor them to see if selling momentum will slow down. If momentum slows down, oil prices might stabilize and resume its long term uptrend. Let us now zoom into the daily chart of Crude Oil and have a close look at what is happening. As you can see, Crude Oil is now hovering at the 50 MA and trying to find support there. In the event that the 50 MA does not hold, we can expect more selling down to the price support area around $58. In order to determine whether selling will end, we need to look at the smaller time frames to give us a clue on what to expect. The chart above is the 60 min chart of Crude Oil WTI Futures. Smaller time frames can often hint to us what will happen in the daily charts. As you can see, the selling started when Crude Oil broke a 60 min uptrend line. Notice also how oil fell when it broke below its 60 min 50 MA. Subsequent selling happen because it broke below support areas. Currently, oil is trading sideways but if the support cannot hold then we might experience more selling in oil prices. Until the trend changes in the 60 min charts, we should expect more weakness in oil. 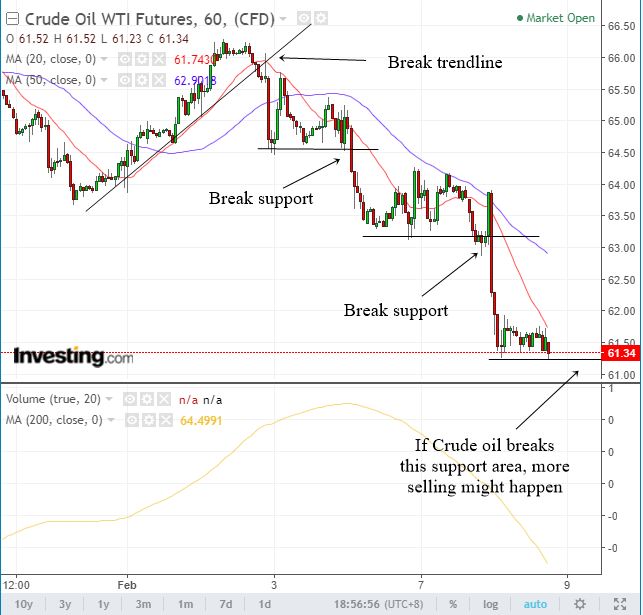 A good way to determine when oil prices might go back up is to watch how the 60 min chart behaves when it hits support areas on the daily chart. If oil can go back above its 60 min 50 MA then selling pressure might stop. Oil is indeed very weak in the lower time frames at the moment. However, the longer term uptrend is still intact. This is what we call short term weakness in long term trend. If oil prices can stabilize as it hits longer term support areas, then we are in no danger of a massive trouble in oil. In fact, it could even be a buying opportunity.